“Redneck Sushi” — Asparagus is Divine! My friend Thom introduced me to Redneck Sushi, and now any special grilling occasion features these delectable little wonders. Yesterday was so beautiful and warm that we dusted off the ol’ grill and whipped some up (along with a plethora of other delights). Here’s how to do both the meaty version, and a special veggie version using our mildly famous eggplant bacon! Be sure your asparagus are in season! They should be crisp & sweet– the thinner the stalk, the better. We went to the fantastic Ballard Farmers’ Market yesterday and picked up a couple of the first bunches of the season. This stuff is so good you can eat it raw. 1. Soak your skewers in water for about an hour before using them– this keeps them from catching on fire on the grill and burning your goodies. 2. Snap your asparagus. Here’s a trick for getting rid of the tough, stringy, woody part of the asparagus. Hold the stalk at both ends and bend. The stalk will naturally snap into two pieces. Discard the bottom piece. Easy, & works every time! 3. Chop the asparagus stalks into 1-1/2 to 2 inch pieces. 4. Cut each slice of bacon in half in the middle– should result in 3-4 inch slices of bacon. 6. Repeat step five until you’ve used all of your ingredients. 7. Cook over indirect medium/medium-high heat on the grill, flipping once halfway through. The bacon fat should get soft and surround the asparagus, sealing each roll together. 8. Remove rolls from skewers, serve and let the mouth-watering bacon/asparagus combination rock your world. If you want to try a vegetarian version that’s danged good, you’ll need to start the night before. 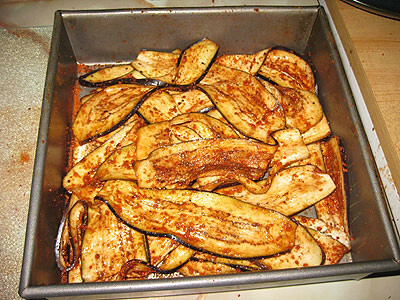 Prep the eggplant bacon following the recipe we’ve featured previously, but stop after part 6. Once you’ve drained the bitter out of the eggplant, instead of cooking it, cover it well with an unflavored oil (we use Canola), and let it sit at room temperature all night. 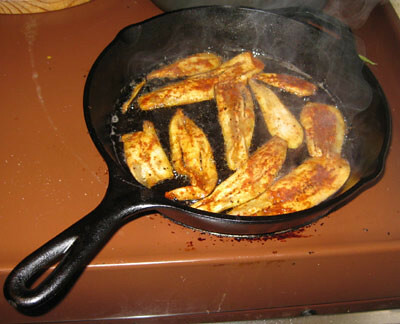 The eggplant will absorb the oil, which will give it the melty consistency of bacon when used in its stead on the grill. Substitue the eggplant for the bacon in the above recipe and challenge your friends to a blind taste test! Fire up your grill, and try some Redneck Sushi today! UPDATE: If you’re visiting this site looking for vegetarian versions of recipes, you might be interested in our Kickstarter Project, Meat/No Meat! In the pantheon of fake meats, those often odious but sometimes pretty good soy and wheat versions of animal flesh to which we are often treated but more often subjected, there has yet to be included an even vaguely passable version of that most empyrean of meatiness, the heavenly gift which is bacon. Oh, many attempts have been made, but bacon is truly the holy grail of those seeking to create a decent substitute for the vegetarian palate. Thus far, the output has been essentially rectangular slabs of cardboard doused with liquid smoke and dyed red (I’m looking at you, Morningstar Farms!). With the advent of a new Miracle Ingredient, however, J– a connoisseur of bacon since he was a wee lad, has discovered that it is now possible to simulate, with an amazing degree of accuracy, delicious, greasy, slightly fatty, vegetarian bacon. That new ingredient? The Wonder that is Bacon Salt. For those not yet initiated into the Mysteries of the Bacon Salt, it’s essentially an admixture of spices somehow alchemicly imbued to impart the flavor of bacony goodness to anything it touches. Delicious on anything savory (popcorn, eggs, Bloody Marys, rice, pasta, etc. ), Bacon Salt should feature on the shopping list of any vegetarian, and is essential for the biculinary set. 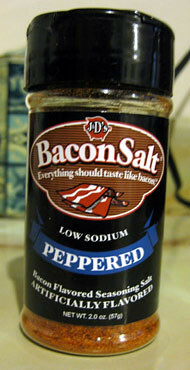 Needless to say, when J– an Ingredient Mentat— procured his first container of said miracle ingredient, his brain immediately began a series of calculations designed to answer the question, “Can Bacon Salt be used to make an acceptable bacon replica that will please the vegetarian but also amaze the carnivore”? What are the characteristics of good bacon that make it so pleasing and difficult to duplicate? It’s greasy, but not too greasy. It’s smoky, chewy, crispy, slightly fatty, succulent and delicious. Obviously, the vegetarian versions produced thus far were unable to provide its fatty succulence, too often focusing solely on the smoky/crispy qualities, which often resulted in something similar to thinly sliced balsa wood charcoal. Now, thought J, perusing various possibilities, very few vegetables or meat substitutes are able to simulate the required fattiness of bacon. There is one veggie, however, that is well known for its ability to soak in and retain both flavor and quantities of oil. It’s also been a recognized substitute for ‘meat’ in various dishes for ages. That’s right, I’m talkin’ about: the ‘umble eggplant. J immediately rushed out to the store and purchased a few (literally, that moment– ask E! ), and after a few experimental batches, produced the following recipe, which is guaranteed to be as close to bacon as a vegetarian will ever get! – 2 small eggplants — Japanese eggplants work best, but small Italian eggplants work, too. They should be small because the smaller the eggplant, the less seeds it has, and as we all know, bacon has no seeds. – Oil for frying — It’s tempting to use olive oil, but Canola works best since you don’t want vaguely olivey bacon. 1) Peel or don’t peel your eggplant. If you like your bacon more crispy, keeping the skin on will help. 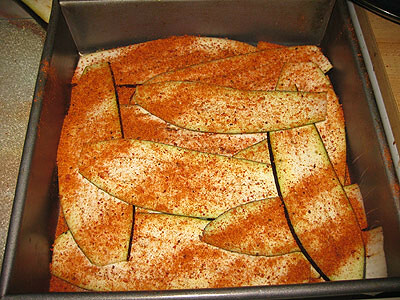 4) Mix the slices about, making sure each piece of eggplant gets a good coating of Bacon Salt. Let the slices sit for about 30 minutes, up to an hour. 6) Lightly blot each slice with a paper towel to remove the excess bitter liquid. You’ll lose some of the seasoning this way, but that’s okay. 8) Remove to a paper towel and enjoy! The absorbent quality of the eggplant will give the final product just the right amount of greasy, fatty goodness. 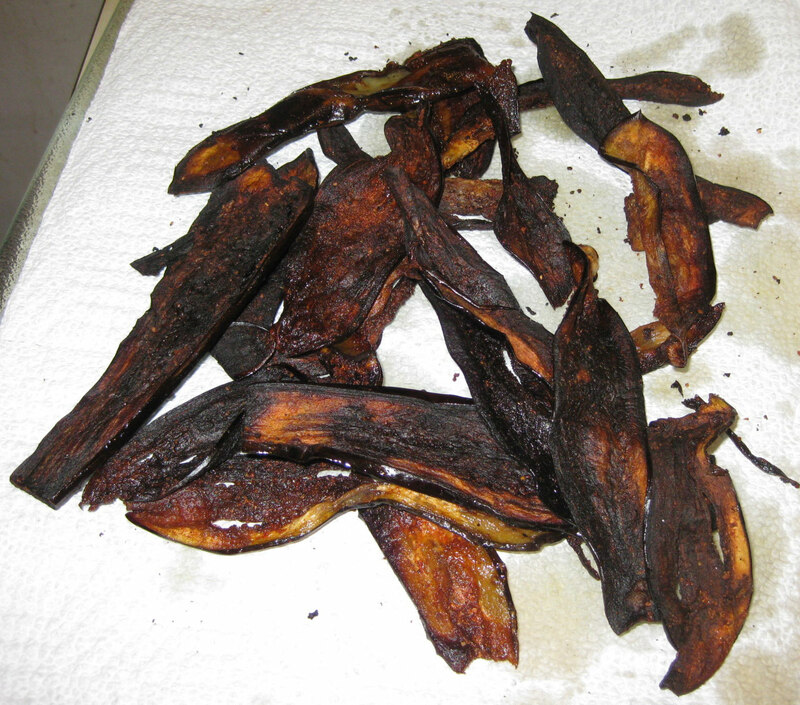 The finished product will look something like this– click for hi-res to see just how “fatty” this eggplant bacon has become! Voila! Excellent on BLTs or as a side with eggs and pancakes, or crumbled over a salad, this eggplant bacon is certain to please even the most dyed-in-the-wool bacon aficionado. WHAT ARE YOU WAITING FOR? HAVE SOME EGGPLANT BACON TODAY! Seattle shoppers can procure Bacon Salt in the spice section of any local QFC , or at Not a Number Gifts in Wallingford. Anyone else can order directly from http://www.baconsalt.com.